Twenty Hotel is established in 2010 and it's a family run hotel. On the top of the building is our Beautiful terrace/Rooftop located where we serve our breakfast. 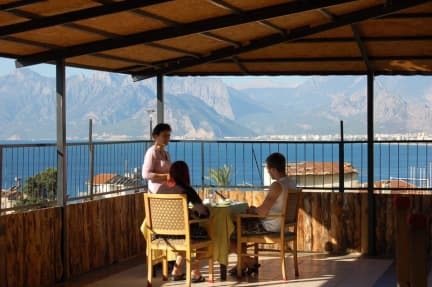 The Terrace has a Panorama view to the Old Town, Antalya City, Sea, Mountains and to many other places. Our Reception is open 24 hours. Located in Kaleici, just behind the famous Clock Tower, makes our hotel an ideal place to stay: On one hand you can wander around Kaleici, and on the other hand you can go to the city center, explore the umbrella street by tasting their delicious food, The Istiklal Street, Ataturk Street, Konyaalti beach. Bus stops and tram station are very easily reached in walking distance. The rooms are located on the second, third and fourth floors. 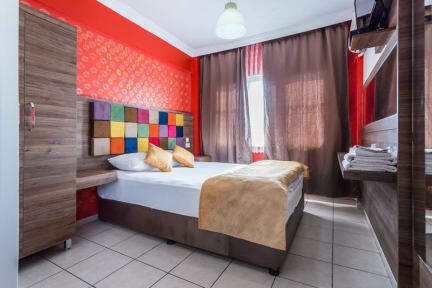 On the second floor we have 8 Standart rooms and 1 Single room. On the third and fourth floor we have 16 Economic rooms with Single rooms or Triple Rooms. Room Facilities: Every room has its own bathroom and shower. Wi-Fi, Air Conditioning, Disposable Slippers, Hair Driers and 24/7 hot water are provided. Room Cleaning: Rooms are cleaned every second day and towels are replaced every day. Our Breakfast starts at 08:00 and ends at 10:00. Accueil chaleureux, personnels aux petits soins et de bons conseil. Hôtel très agréable, à proximité de tout ( plage, parcs, restos...) Petit déjeuner copieux et bons, et l'hotel propose de très bonnes excursions à prix raisonnable.